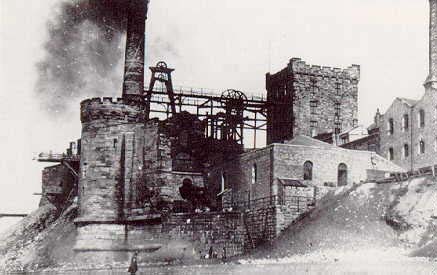 The Wellington Pit was owned by the Whitehaven Colliery Company and was close to the sea shore in the town. There were three shafts, a coal drawing shaft 298 yards deep and 12 feet in diameter, an upcast shaft 12 feet in diameter and 204 yards deep and a water or pumping shaft 8 feet in diameter and 298 yards deep. The coal that was worked was the Main Band and was about 10 feet thick and worked by pillar and stall. A main haulage road extended from the shaft for about 4 miles due west under the sea and had a dip of about 1 inch to the yard. There were no horses in the colliery and the tubs were trailed by the workmen to the brakes or headings and from there by mechanical means to the shaft. 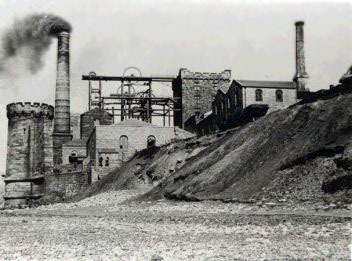 The ventilation was by Walkers Indestructible Fan, 24 feet in diameter which was placed near the top of the upcast shaft and usually ran at 126 revolutions per minute. The air was last measured on the 4th, May, which was seven days before the explosion on the main intake at a point near the down cast shaft and totalled 49,680 cubic feet per minute, while at the friction gear still on the main intake it was 28,000 cubic feet per minute. This was the whole of the ventilation available for three large working districts with about 200 workmen on each shift of three shifts a day. The average output of the mine was 850 tons per day. Paraffin lamps were used at the bottom of the shaft and the lamp station for examining the safety lamps which were used exclusively in the mine, was at the bottom of the main haulage road between two and three miles from the shaft bottom. The lamps that were used were Ackroyd's and Best's Clanny Lamps with a single gauze. They were electrically locked and lighted. No shots were fired in the coal or in any of the working places but shots were fired in a stone drift in the third north district and occasionally in the main haulage road and intake. The holes were charged and fired by an overman and a permitted explosive was used and fired by an electric battery. "We, the undersigned, hearby certify that we examined all working places, shafts, levels, planes, return airways, bearmouth exit, and all machinery, and found all in safe working order. The workmen were transported in coal tubs by the haulage arrangement from the friction gear to the bottom of the shafts. On the day of the explosion the night shift had gone in to change with the back shift in their working places. At about 6.30 p.m. the first set of workmen from the back shift had been raised and gone home. The second set, about 60 men, had arrived at the bottom of the shaft when they felt the air reverse and saw large clouds of dust behind them. They went to the shaft and some of them went to inform the manager at the pit top that something serious had taken place in the workings. This was at 7.40 p.m. The undermanager went down the pit and found that the hitchers and on-setters were not sending tubs of coal up the pit. He boisterously inquired why this was not being done. The men answered that there were uncertain what had happened when the air reversed and they had failed to get any replies from telephone calls. The phone lines extended to the friction gear from the pit bottom. The undermanager got a workman, Daniel Benn and they went down the incline. The rest of the men left the bottom of the shaft and resumed their normal employment, sending full tubs up the shaft as if nothing had happened. How the undermanager, Mr. Henry, and Benn spent the time from 7.45 p.m. when they left the bottom of the shaft until 10 p.m., two hours and fifteen minutes, when they were overtaken by Dr. Harris and others on the incline near the fan house is only known to themselves. They stated that they were engaged with two workmen who they discovered unconscious on the incline and had performed artificial respiration on them for more than an hour and that they had gone to examine the return at two points. It was known that the two men left the pit bottom at 7.45 p.m. and from conflicting statements it was thought that they discovered the two unconscious workmen at Benk's Turn at about 8.30 p.m. At 10 p.m. they met two workmen from the No.5 District, Weir and Kenmore, between the Benk's Turn and the fan house and they arrived at the fan house between 10 and 10.30 p.m.